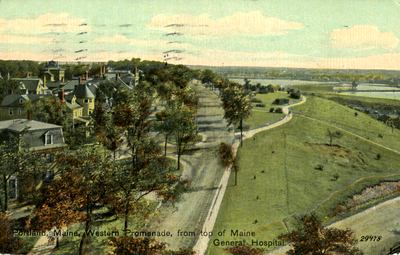 "Portland, Maine : Western Promenade"
High-angle southbound view of Western Promenade, seen from top of Maine General Hospital. Fore River, Portland Harbor, and Vaughan's Bridge in background. Postmarked 18 July 1911. "Portland, Maine : Western Promenade" (1911). Portland Postcards. 25.